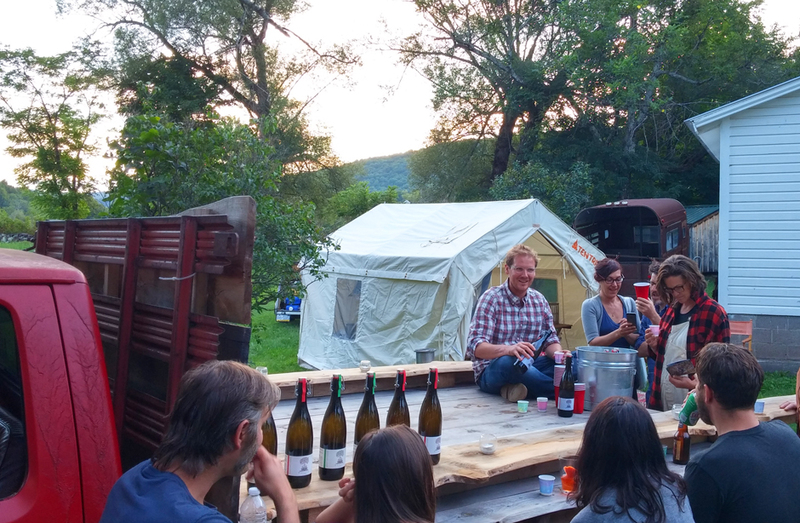 Catskills farm cidery Wayside Cider is taking a big step toward its future. Two years after founding the company at a Delhi farm, partners Alex Wilson and Irene Hussey are expanding to a larger production space and opening a tasting room in Andes. The pair are under contract to purchase the Decker building, a large barn at 55 Redden Lane in the center of town. Their proposal received preliminary approval from the Andes Planning Board on Monday night. If all goes according to plan, Wayside’s owners hope to open this summer, in time to serve their second season’s offerings and process this fall’s harvest. “It’s a nice big space for production, and we want to have a very nice tap room there,” Wilson told Catskill Eats this week. The tap room will sell the full line of ciders made from Catskills-grown apples, as well as other local fare such as cheese. The building is being sold by Bill Day, who currently uses the barn for storage for his construction business. It sits on .3 acres just off Main Street, near the flashing light. Wayside will continue developing its orchards at its original location, High Meadows Farm in Delhi, and lease additional land to plant more apple trees, Wilson said. The cidery about tripled its production from its first year to its second, with this year’s yield approaching 15,000 bottles. The company’s cider is for sale in Catskill-area restaurants and retail shops, as well as in the NYC metro area. This is not Wayside’s first foray into Andes; last summer, the cidery paired up with curiosity shop Kabinett & Kammer for a pop-up store, tasting room and farmers’ market on Saturdays at 11 Delaware Ave. Places to enjoy locally grown and produced food and beverages are growing in Andes. The team behind Argyle Farms took over and reopened the Andes General Store last fall, offering local meats, cheeses and other farm products. A new brewery, Weaver Hollow Farmhouse Ales, is under construction in the former Greenfish Adventure Sports building. Weaver Hollow, specializing in Belgian-style beers, plans to open in 2017. Dirty Girl Farm, which produces goat milk and cheese at its Perch Lake Road farm, also plans to move into the center of Andes. Farmers Cyndi Wright and Lester Bourke received permission from town officials last fall to move their operations and open a retail store at 114 Delaware Ave. This morning, Wright said the couple is in the process of listing their house for sale, as part of the plan to finance the move, as well as working with an investor. “It’s still a work in progress,” Wright said. Bovina coffee roaster Mark Foster had been considering opening a FosterBuilt Coffee shop in the former Tay Tea shop. (Tay Tea relocated to Delhi this winter.) Though he has decided not to pursue that option right now, Foster said this week that he will set up his mobile coffee trailer at the new Wayside Cider headquarters when it opens. Related: Read more about Wayside Cider in our 2015 profile.